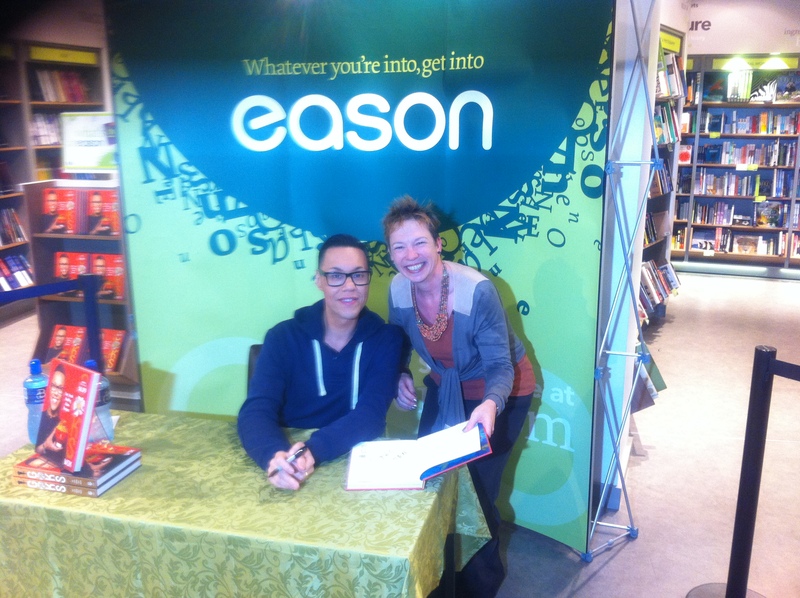 I recently had the pleasure of meeting the adorable Gok Wan, and this week I’ve been trying some recipes out of his new book. For my 5:2 fast day dinner, I made Vietnamese salad. 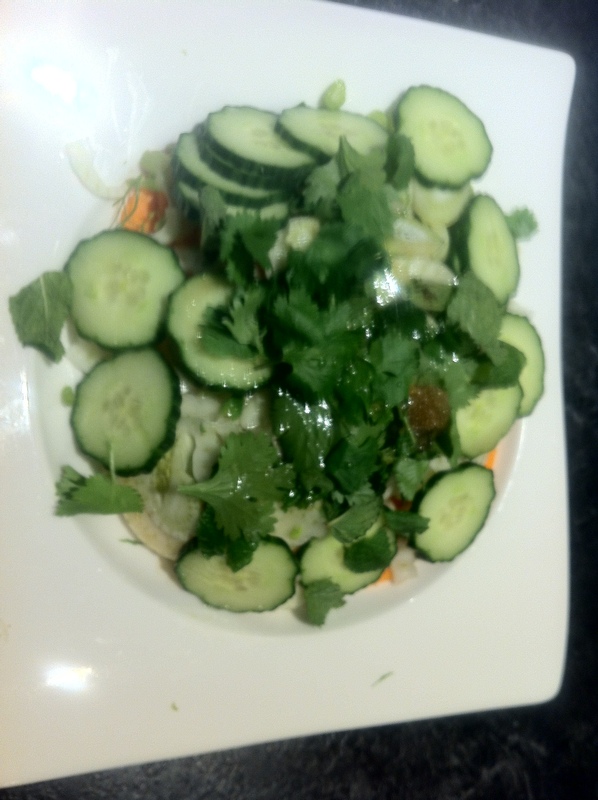 This is finely shaved fennel, carrot and cucumber, in a dressing made from sesame oil, fish sauce, palm sugar and lime juice, with mint and corainder to garnish. The dressing was lovely, but the raw veg were very crunchy. I might try grating them next time. But about 80 calories per portion, so its a good low-cal option. 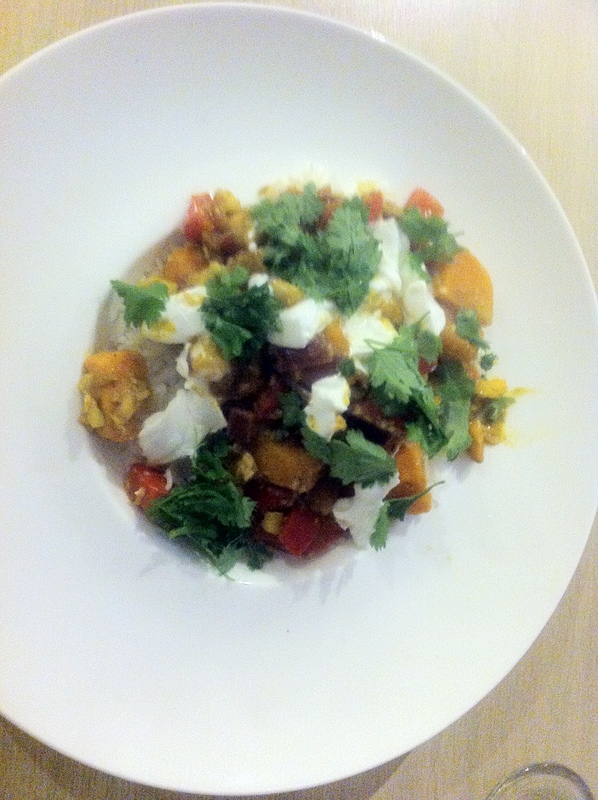 I’m always intrigued by new combinations, and I was looking forward to trying sweet potato and brazil nut curry. Peel, dice and boil 500g (that’s about one large) sweet potato. Dice one red onion and one red pepper, and saute in a wok. I used coconut oil, but the recipe suggests rice bran. Add half a tablespoon each of cinnamon, Chinese 5 spice, turmeric, and chilli powder. When the veg have softened, add half a tin of light coconut milk. Stir in the cooked sweet potato, and 50g chopped brazil nuts, and 3 tablespoons dessicated coconut. Serve on flatbread or rice with a few blobs of yoghurt, and granish with coriander leaves. This was an interesting combination of textures, with the soft potato and the crunchy nuts. And if I was avoiding carbs I would just have it alone rather than adding any bread or rice. Around 450 cals per portion. I like the book, but it doesn’t have a picture for every recipe, which is a shame. It also could do with a bookmark ribbon.